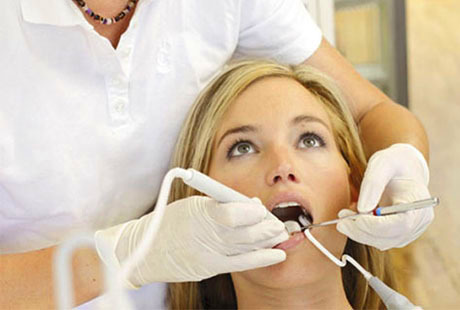 Prophylaxis - also called dental cleaning - is an intensive, thorough removal of hard and soft dental deposit which forms from time to time, even with the best mouth hygiene. This dental deposit - also called plaque - is comparatively harmless, but a perfect niche for bacteria. Since the defence cells within the saliva cannot access the plaque, dental deposit is a perfect place for bacteria to grow. In the long run, those bacteria will destroy the teeth or even worse, harm the gums and jawbone. When the jawbone has already declined, there is a high risk to finally lose the teeth without being able to stabilise the bone again. With the help of a thorough dental cleaning the defence cells are again enabled to fight bacteria and to stabilise the system. Very sensitive teeth can be desensitised before the treatment. First of all the dental plaque will be eased, afterwards the plaque and discolouration will be removed with the help of Airflow, a kind of sandblaster, and in the end the surface will be smoothed, sealed, fluoridated and hardened with polish. With this method you have the opportunity to keep your mouth hygiene on top standard for a long time. Your smile will look gracious again and bad breath vanishes.